Freestyle skiing. Little boy jumping in a snowpark. A 5 year old child enjoys a winter holiday in the Alpine resort. Stabilized shot. Slow motion. Skiing. Alpine Skiing. 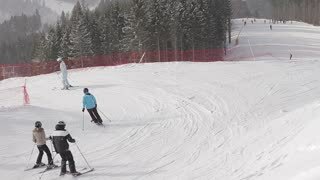 People learn and fall while skiing. Sharp ski slopes. Careful skiing skiers. 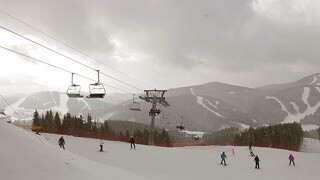 Snow on ski resort.